Every Faye Judson Salon staff member is extensivly educated in all our product lines and dedicated to helping you find products that fulfill your every hair need! Aveda® is a product line that is internationally recognized as a brand committed to environmental sustainability and making a difference in our world. With the use of 97% certified organic ingredients and eco-friendly recycled packaging, they strive to set the example for environmental responsibility. Botanically infused and always 100% sulfate free, DevaCurl’s ® interchangeable product line allows for individuality, simplicity, and freedom to address your curly hair’s specific needs. DevaCurl’s products are all inspired by two decades of conversations with real people. It’s curly, it’s complicated, it’s fun, and we get it. Our stylists won't just give you amazing curls, they'll teach you how to create them on your own. Curly hair is bold, natural, beautiful, and it’s our mission to celebrate your unique curls. Oribe®, the eponymous product line from one of the most influential hairdressers of all time, defines luxury in hair care. Combining over 30 years of styling heritage at the top of the editorial and salon worlds with old-world craftsmanship and cutting-edge innovation from the most sought after beauty artisans. The Oribe line delivers the highest possible levels of performance and sophistication. The Wella® name is synonymous with innovative hair care and are consistently the first to market with new technologies developed to meet the ever changing needs of the consumer. 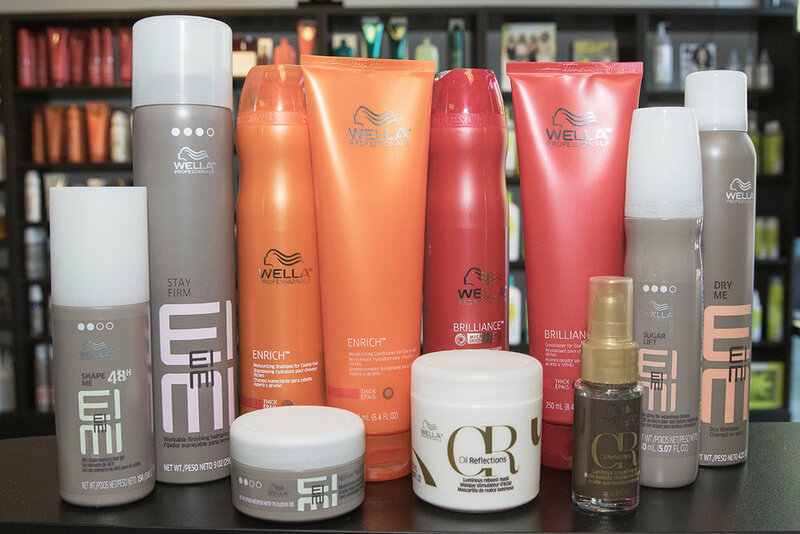 With some of the most recognizable brands in the industry the Wella name and logo is a guarantee of performance and quality. With over 30 products to choose from, Wella allows you to get the latest hairstyles at home and in the salon. ColorProof Evolved Color Care® is a complete line of professional luxury products designed exclusively for color treated hair. These next generation formulas combine the latest innovations in ingredient technology with best in class ingredients to create a new standard in color care. OUR STYLISTS HAVE TESTED everything personally, and we strive to Use products that are just right for your hair.